What’s Behind the EPA’s New 4-Gallon Minimum Purchase Mandate? The latest mandate handed down from the Environmental Protection Agency (EPA) is so ridiculous, even I was shocked. The EPA has now mandated how much gasoline you must buy at certain gas stations. Say hello to the Obama Administration’s four gallon minimum. So what’s this all about? 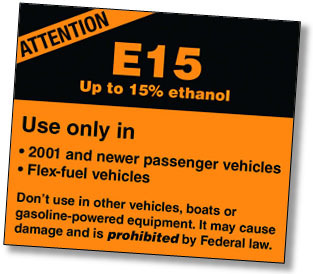 Well, the ethanol industry has been lobbying for a quite a while to sell E15 — a blend of 85% gasoline and 15% ethanol. Why? Because they want to sell more ethanol, and E15 contains more ethanol than the current E10 blend. But they’re not the only ones in favor of E15. The Renewable Fuel Standard, passed in 2007, requires ever greater use of ethanol, and refineries are afraid that before long they won’t be able to meet the RFS standards unless they can sell the E15 blend. But if the ethanol industry is in favor of E15, you can probably guess that the petroleum industry is against it. And you’d be right. After all, 5% more ethanol means 5% less petroleum. Gasoline sales have been declining for the past few years anyway, and the petroleum industry is none too happy about losing even more market share if E15 blends come onto the market. and, as the Outdoor Power Equipment Institute will tell you, it doesn’t work in devices like chain saws, utility vehicles, and lawn mowers. In fact, it can destroy those things if you use it accidentally. But it gets worse. Most gas stations don’t want to install new tanks just for E15. Instead, they’re installing blender pumps, which mix the ethanol and gasoline together in the right proportion depending on which one you want. But there’s a problem: if you pump E15 into your car, about a third of a gallon remains in the fueling hose when you’re done. If someone comes along, switches to E10, and buys a single gallon for their lawnmower, they’ll get a third of a gallon of E15 and two-thirds of a gallon of E10. That comes to about 11.7% ethanol, and that might be enough to set your lawnmower on fire. Generally speaking, corn ethanol isn’t any better for the environment than petroleum. So forcing more use of ethanol doesn’t make much sense in the first place. E15 can destroy small engines. The EPA requires gas stations to post a warning sign, but we all know how much attention people pay to warning signs in gas stations. We’re probably going to end up with a fair number of fried snowblowers and ATVs before this is all over. People who buy gasoline for outdoor equipment usually only need a gallon or two. Ditto for motorcycles, many of which have gas tanks smaller than four gallons. So at gas stations that sell only E15/E10, these folks won’t be able to fill up at all because they won’t be able to meet the four-gallon minimum. These aren’t actually gigantic problems, and if ethanol truly had a lower carbon footprint than gasoline I might figure that it was worth going through some minor growing pains to encourage greater use of it. But it’s really not. So to my surprise, I find myself agreeing with Sensenbrenner. If we ever get to the point where we can mass-produce ethanol that’s truly better for the environment than petroleum (cellulosic ethanol, cane ethanol, etc. ), then it might be worth going through all this. Until then, it’s probably not. And the Renewable Fuel Standard that started all this? It wasn’t such a great idea in the first place, and as long as it mandates increased use of corn ethanol it never will be. It deserves a thorough revision.